After having held the world record for an Omega Speedmaster 2915-1, Bukowskis is pleased to once again present one of the world’s most sought-after collector’s items in the world of watches, an Omega Speedmaster 2915-2. The watch will be on view and on sale at the internationally renowned auction Important Timepieces, starting 9 April. 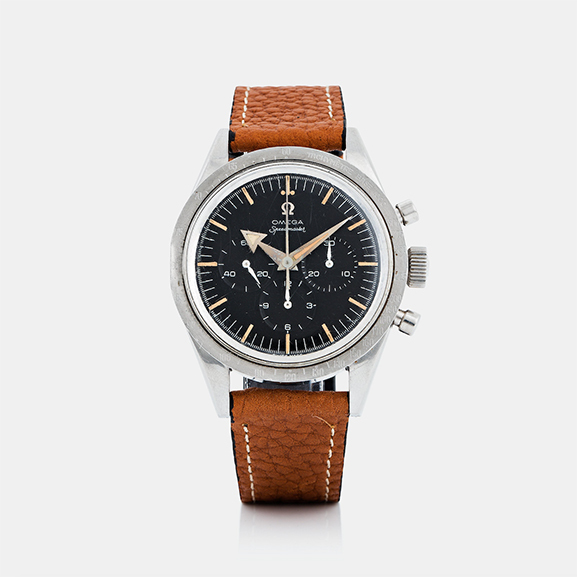 Omega Speedmaster 2915-2 is one of the most sought-after and rare watches hitting new price records. The watch presented in the auction is from the late 50s and is one of the first models of Omega Speedmaster, also known as 2915-1, produced in 1957. –The watch stands out with its broad arrow hands, the original base 1000 tachymeter scale on the steel bezel and a patinated dial in original condition, says Carl Palmegren, Head Specialist Watches. The watch incorporated in the auction, now re-discovered from a drawer, has been within the same family since it was purchased. Not knowing about the value, the owner left the watch in the drawer and only worn it occasionally during the last 20 years. The owner inherited the watch from his father in the late 70s. –After previous re-discovered treasures from the garret and world records I thought it would be a long while before something like this were to be presented by Bukowskis again. And now it happens, for the third time. I am very excited to follow the auction for this rare piece, says Carl Palmegren, Head Specialist Watches. Read more about Bukowskis previous world record for the Omega Speedmaster 2915-1. Follow @bukowskiswatches on Instagram and @mondanievents to be always informed about the best events in the world of luxury and watches.